This peak is #1 on the Height List for Alberta . This peak is #1 in Prominence List for Alberta . This peak is #11 on the Height List for British Columbia . This peak is #11 in Prominence List for British Columbia .Mount Columbia is the highest point on the continental divide between BC and Alberta. It is located near the head of the Athabasca River (Arctic Ocean), and separates it from the Columbia River (Pacific Ocean). 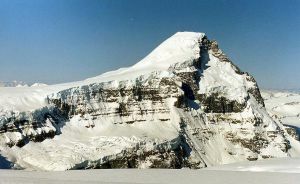 Although it is the highest peak in Alberta, Mount Robson and others are higher in BC. From the north, the mountain towers almost 8000 ft above the Athabasca River valley. Height Notes: BC Basemap gives a height of 3741m. Putnam (1974) says 12,294, Corbett gives 3747 (12,293 feet), which is the same as PeakFinder. In general, Corbett and Peakfinder stick with the old guidebook numbers, rather than the newer TRIM survey numbers. Name Notes: The peak was named by Norman Collie in 1899 after the Columbia River. The Columbia River was itself named in 1792 by Captain Robert Gray after his vessel, the Columbia. Interesting to note that in 1924, the peak was officially given the more proper name "Columbia Mountain", since having a prefix of "Mount" is usually reserved for peaks named after people. However, in 1956, the official name was changed to reflect the entrenched local form of the name.